Precaution: the author (me) is lately sharing a load of personal, retrospective findings with the world (you). Must be that he’s leaving some troubles and worries behind him. Or maybe it’s just the pills he’s taking? It wasn’t until I started doing projects upon eXtreme Programming (2003) and Scrum (2004) that I finally found my way in IT, and started feeling at ease at a personal-slash-professional level. It then still took me several years (>2011) to find a professional homebase (some call it an employer) where I could really ‘go’ for my Agile and Scrum ways. In the early years I never cared about profile or promotion; just me, expertise & the teams. But on the cross-point of deciding yes or no to stay in IT consultancy, I decided to give it one more chance. But it would be a ‘make or break’ and it had to be Agile and Scrum. I resurrected the knowledge and experience hidden in my brain and started publishing about it again. I finally went to Capgemini (March 2010), attracted by the fact that they had co-founded the Agile Consortium Belgium. This was around the time that saw the emergence of Scrum.org by Ken Schwaber. I had my CSM by Ken back in 2004 but that was it. Never even considered CSP, CSC, CST or any other CS*. My reluctance for profile and promotion, you know. 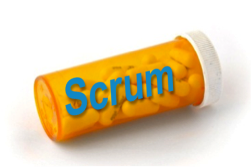 I liked the feel and the why of Scrum.org and engaged early. Full of doubts, but I demonstrated a good understanding as Professional Scrum Master, level I and level II. Confidence grew, I applied for PSM trainer, went to a PSM course by Ken (December 2010) and qualified as trainer. Happily invited at an early class of the new Professional Scrum Product Owner program (April 2011), I fully subscribed the program’s goal of reaching out to Business people and helping Agile Product Management emerge. I demonstrated my understanding and my training qualification was extended with PSPO. The official Scrum.org trainings PSM and PSPO. Our strategy connects to the vision of Scrum.org in presenting Scrum as a tool for Business Agility, not as an end in itself. As from Capgemini I sincerely hope to have impact but from a positive, open and adaptive attitude. Not grumpy or bitter or aggressive. Knowing that the path to Agility will remain a cobblestone path and there will be ups and downs. Keep an eye on the overall progress trend, a burnup chart of Agile values and Agility. Make the world a better place (to work in).